A couple of weeks ago, I came across a magazine at the grocery store that was packed full of Fall Recipes…so I grabbed it. As I’m flipping through the different items, I wanted to make almost everything in there, all at once. It was a bit distracting, and of course having to pick and choose what to make now, along with what to make later. Well, since we recently went to an orchard and loaded up on apples, I decided to use this on my in-laws when we were all vacationing together at the beach. They love my fluffy pancakes, so I decided to make these. The pancake recipe is pretty much the same, except with a slight substitution of a small amount of light brown sugar and some added cinnamon. The caramel apple sauce though…oh wow. When I dressed my plate up to get some pictures and then sat down to eat, it was incredible. I had to stop myself from eating every last bit of these three pancakes covered in bliss. “Forget syrup, I’m making this for pancakes from now on!” I told my husband. These were incredibly delicious, and I look forward to making them for my family next time! Heat skillet at medium heat. Combine dry ingredients in medium size bowl. Add wet ingredients, stir together using a whisk. Batter will be slightly lumpy. Measure batter 1/4 cup at a time, pour onto hot skillet. Sprinkle a small amount of pecans on top of batter. When you start to see bubbles on top of batter, flip pancakes over using spatula. Cook until lightly browned on both sides, serve warm with caramel apple topping. 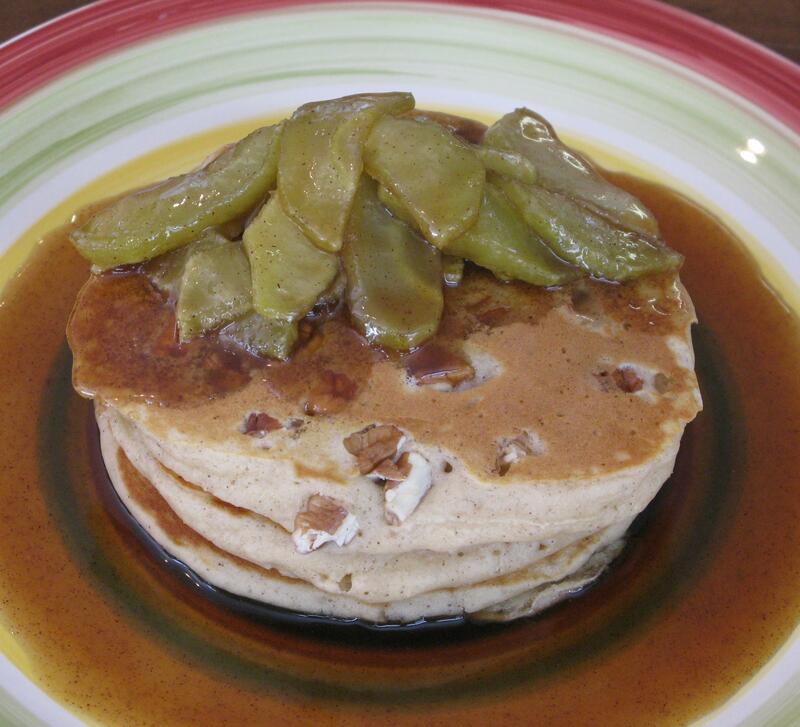 *If you’re not a fan of pecans (or nuts, in general), this recipe is very easy to omit adding nuts to each pancake. Melt butter in small sauce pan at medium heat. Add brown sugar and cinnamon, stir until dissolved. Add apple slices, and cook in pan until apples are soft. Serve warm over pancakes.